Ready to take your inquisitive little one on a rip-roaring ride through history and back? 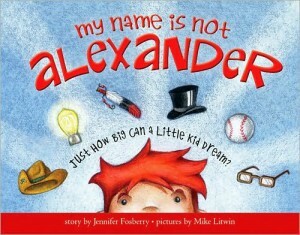 Then My Name is Not Alexander, by Jennifer Fosberry, is the perfect book for you. In My Name is Not Alexander, a lively and precocious boy named Alexander lets his imagination run wild as he interacts with his doting father. As the father coaches him through day-to-day activities like eating breakfast and preparing for his baseball game, Alexander imagines himself to be all sorts of interesting, important men who changed the world: Adventurous men like Theodore Roosevelt, inventive men like Thomas Edison, and brave, unforgettable men like Jackie Robinson and Chief Joseph. My Name is Not Alexander is a great book for jump-starting the imaginations of young children trying to decide what they want to be when they grow up. The short, easy-to-read prose is clever and funny, and leaves a smile long after the last page has been turned. The icing on the cake, of course, is marrying the book’s unique prose with artist Mike Litwin’s stunning illustrations of Alexander and the heroes of his imagination. Litwin uses warm, deep colors with his exaggerated illustrations, resulting in artwork that is almost 3-D in its look and feel. Even the front cover is a veritable feast for the eyes, with hats, feathers, light bulbs and glasses floating merrily above little Alexander’s inquisitive head and firing his (and everyone else’s) imagination about life and it’s curious possibilities. I guess you can tell I absolutely love this book. There is an illustrated bio section in the back that explains what each hero of Alexander’s imagination accomplished in his lifetime. Fosberry also shares a very detailed bibliography of books and websites that can be consulted for further information. Good stuff! My only regret, after reading this book, is that I gave away its fraternal twin, My Name is Not Isabella, several months ago. Each wonderful book is a stand-alone work of art, and it is my opinion that not having both books in the set is a mistake that doesn’t need to happen. In other words, complete the set. You’ll be glad you did. To order, just click on the icon on the right. Congratulations, Ms. Fosberry, you’ve done it again. Thanks for Alexander, thanks for Isabella, and thanks in advance for the next little hero or heroine you plan to share. I can hardly wait.